A large concern for business owners is how their operations will affect the health of their customers and employees. When it comes to thermal receipt paper rolls, the conversation usually revolves around the use of the bisphenol A (BPA) chemical. A significant amount of the thermal receipt paper sold in the US includes this compound, so it’s worth exploring whether it presents a danger to people and whether alternative technology offers safe and effective solutions. Why is BPA Used in Receipt Paper? BPA was traditionally used as a coating because it provides stability and heat resistance while providing the thermal image. These properties ensure that the thermal paper safely changes color when exposed to heat without starting a fire. It also means that receipt printers don’t need ink to work, allowing for faster printing and fewer printer parts that can break. The printing quality of this type of receipt paper is typically higher than alternative options, with minimal bleeding and deep blacks for high legibility. Is BPA in Thermal Paper a Significant Health Risk? There has been plenty of debate over the health effects of BPA in receipt paper. It is understandable that some people have concerns over the chemical, as it is an endocrine disruptor, which in large quantities interferes with the functioning of natural hormones in the body. The highest risk when it comes to BPA exposure is for infants who are more sensitive to the chemical. It is very unlikely, however, that a person who handles thermal paper throughout their workday will be exposed to toxic levels of BPA. According to a study published by Springer-Verlag, a person who handles receipt paper for ten hours per day is exposed to 71 μg of BPA on average per day. This amount is 42 times less than the tolerable daily intake (TDI), or the estimated amount of BPA a person can be exposed to on a daily basis throughout their lifetime without a significant health risk. This study focused on people who use receipt paper extremely frequently, so most people are exposed to far lower amounts of BPA from receipt paper. The most common choice for BPA-free receipt paper is a type that contains bisphenol S (BPS). The problem is, this chemical has many of the same properties as BPA, which is what most people are trying to avoid when they opt for BPS. A study in Endocrinology showed that BPS has hormone-mimicking effects, which can alter an organism’s reproductive system development. In fish, exposure to BPS led to premature births. Another BPA receipt paper alternative is a urea-based compound that is both BPA and BPS free. At Paper Roll Products, we sell this variety to customers who are concerned about the health effects of BPA on their employees and customers over time. Urea-based compounds do not trigger the same hormone altering effects that happens with large amounts of exposure to BPA or BPS. It’s important to be aware that urea-based paper costs more than BPA/BPS coated paper and while the print quality of BPS is not as dark and crisp as BPA, the urea paper actually provides the best overall print quality. 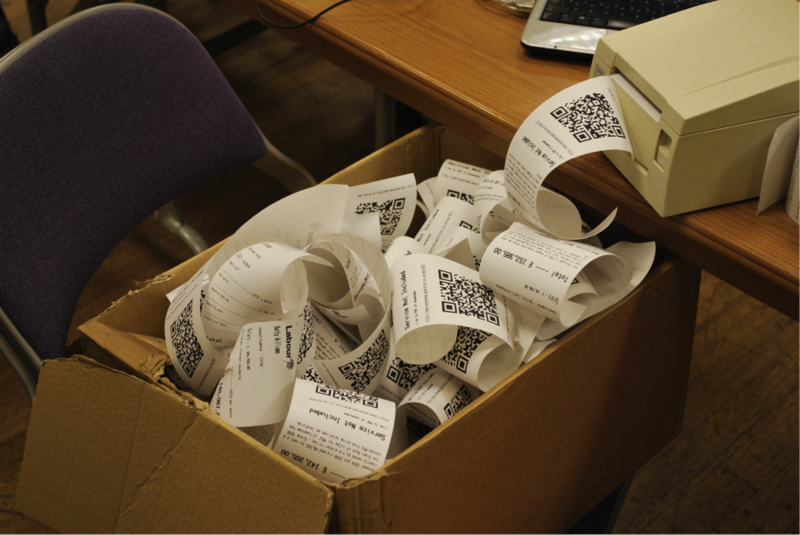 Every business owner will have different preferences when it comes to receipt paper type. If concerns about BPA and BPS have you worried about your next purchase, talk to our experts about urea-based alternatives. On the other hand, if are looking for a cost-effective receipt printing solution that is still unlikely to cause significant health issues, going with a standard paper type may be your best choice. If you have any questions about receipt paper solutions, don’t hesitate to contact our friendly experts. We’re happy to provide the answers you need.